Features cobalt blue cut to clear. The glasses have the circular St Louis trademark on the underside of the base. This would make a wonderful gift or a great way to add to a St Louis stem service of one of the very best crystal makers. Red cut to clear crystal. Acid stamp on bottom. Pieces can vary by size, weight, air bubbles and markings. They may not match your pieces exactly. Pre owned - in very good condition. Beautiful glass! St. St Louis Tommy set of 2 Claret wine 5 7/8"
They are in the Tommy Pattern from St Louis Crystal. One glass has a rough spot on the outer rim. Each glass hold 3.7 fl oz. There are 4 glasses included. Dark blue cut to clear crystal. Acid stamp on bottom. THE BRIMFIELD ANTIQUE CENTER - OPEN YEAR ROUND! Tommy Bahama St. Louis Cardinals 2011 World Series Champions, 1/4 Zip Sweatshirt, Size XL. Preowned excellent condition. Dark green cut to clear crystal. Acid stamp on bottom. Light green cut to clear crystal. Acid stamp on bottom and a sticker. Light blue cut to clear crystal. Acid stamp on bottom. Piece: Continental Goblet. Pattern: TOMMY. Manufacturer: St Louis. Helpful Links. Canadian and international orders. U.S. Expedited. Piece: Highball Glass. Pattern: TOMMY. Manufacturer: St Louis. China - Dinnerware Crystal & Glassware Silver & Flatware Collectibles. Canadian and international orders. U.S. Expedited. Pre owned - in as is condition- one glass has a large chip to the rim. The other glass as a large chip to the rim with two long cracks extending from the chip. Pieces can vary by size, weight, air bubbles and markings. Each has the ST LOUIS acid etched mark in the center of the bottom. In such fine condition likely never used. These are 7" tall. We're here for you. St. St Louis Tommy set of 4 Cordial goblets 4 1/8"
ST LOUIS FRANCE SIGNED SET OF (8) "TOMMY" PATTERN HOCK WINE GLASSES. GREEN CUT TO CLEAR. 7 3/4" H X 3 1/2" W. IN ORIGINAL ST LOUIS BOXES. 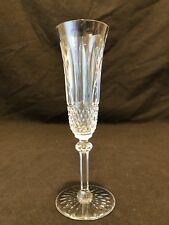 Piece: Champagne Flute. Pattern: TOMMY. Manufacturer: St Louis. Helpful Links. Canadian and international orders. U.S. Expedited.